Miller’s Tree Service specializes in tree removal, but our services also include tree mitigation. Mitigation is the process of planting healthy trees to compensate for the removal of dead or dying trees. It usually occurs when someone decides to build a house on a plot of land with many trees. When done correctly, the size and species of the removed trees must be considered, and a healthy amount of replacement trees must be planted. Mitigation is an extremely vital part of the tree removal process. Without it, an environment may have a drastic negative change after the removal of any number of trees. While it is common knowledge that trees and greenery reduce the levels of carbon dioxide in the air, they actually do so much more. Trees may also be used to cool homes with their shade or act as a barrier between buildings and the surrounding environment. In addition to benefiting the environment, these actions benefit building owners by saving them money on electric and air conditioning bills. If you are considering adding tree mitigation to your tree removal process, it is extremely important that you discuss it with a professional contractor or arborist. 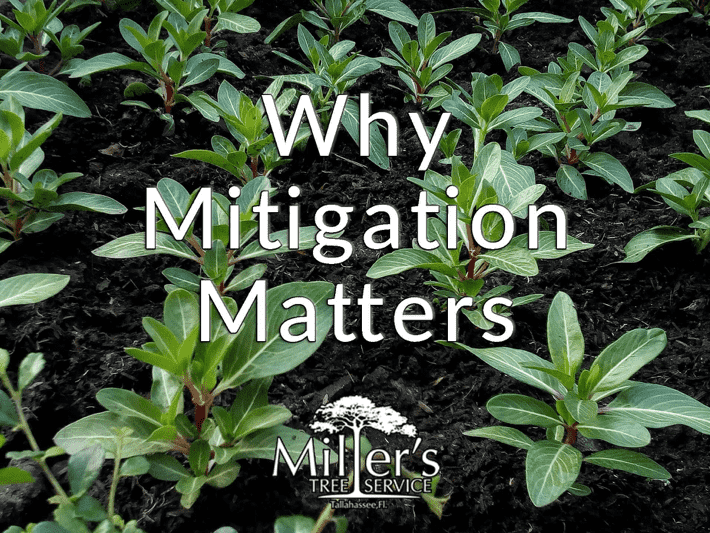 Although it may not seem like it, mitigation is more than planting saplings in your yard. Professionals are required to assess your tree removal process and determine the best way to replace any removed trees healthily . An attempt to tree mitigate a property by yourself may lead to more damage than help. If you’re interested in tree mitigation services, give our team at Miller’s Tree Service a call today. With over 50 native tree types in Florida, it’s entirely possible you have more than a couple of species in your backyard! 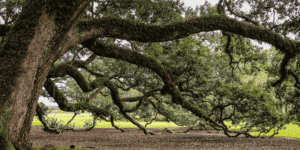 Although not all trees you see are native, they are usually easy to determine; they tend to thrive more in the ever-changing climates of the Florida Panhandle. 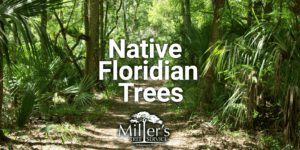 Here are just a few of the most popular native trees in Florida. The native Live Oak is definitely one of the most popular trees in the North Florida area, especially in Tallahassee. Characterized by its massive trunk and large limbs, they tend to be draped in Spanish moss, and produce a lot of shade. With the average size being 60 feet tall and 80 feet wide, they need a LOT of room to grow. If planted in the perfect area, they can develop for centuries. However, if you plan to add this tree to your landscape, you must be sure to do plenty of pruning when it is growing in its early years. When it’s older, the wood it immensely strong and durable to even hurricane winds. Live oaks are one of the safest and most stress resistant trees in our area. They handle the impacts from construction, storms, stress and disease as well as or better than any tree we have in the South. Although not as common as the Live Oak, you may just have a Southern Magnolia tree in your front yard! They love the light, so at their tallest point, they can grow to be around 75 feet tall. 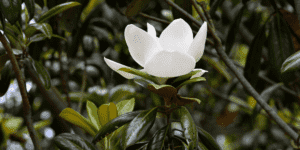 During the spring and summer months, a Southern Magnolia is attributed for its’ beautiful cream-colored flowers that can grow up to 12” in diameter! However, even when the blooms are not in season, the tree manages to keep most of its’ leathery green leave. As far as flowering trees go, this one takes the cake! Although its’ size isn’t large – only about 25 feet at maturity – the blooms that this tree puts out in spring sure are. Along the bare branches, clusters of pink or white flowers appear to beautify your landscape. However, they don’t last forever! In the summer, the flowers will fall and be replaced with dark green leaves – perfect for any Florida front yard. 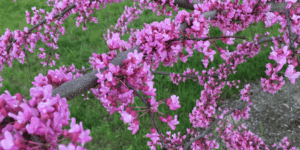 Are you interested in planting a new tree in your yard? 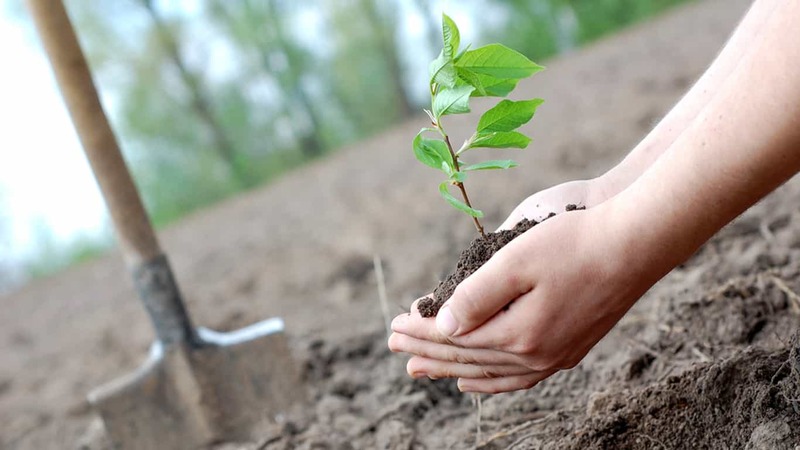 Before you do, it is important that you ensure the tree can be transplanted successfully! A recurring problem that comes with purchasing saplings from a nursery is circling and girdling roots. This is the result of having the said tree remain in the container for too long. Naturally, roots keep extending outward to increase the maximum amount of water and nutrients and to support the tree from tipping over. However, being in a container forces the roots of a tree to circle around the wall. There are methods you can take before and after purchasing a tree to ensure it has a healthy and long life. To start, the first suggestion is to remove the tree from a container and inspect the roots of a tree you seek to purchase. While the roots support the base of the tree, they are also in charge of absorbing nutrients and water. Regardless if you transplant a tree with circling roots into Earth’s soil, the problem of circling roots will persist because that is how they have been conditioned to grow. On top of providing less support to the tree, circling roots strangle the tree. This stuns development for the tree. In the worst cases of circling roots, stem girdling roots form. Stem girdling roots are roots which grow up and over the root flare and base of the trunk. These crossing roots will cut off the conductive tissue below the bark causing part of the tree to decline and branches to die. The carbohydrates produced in the foliage cannot be moved into the roots and the affected roots can die. Because the stem girdling roots block conductive tissue, water and nutrients absorbed by the fine roots cannot move into the upper part of the tree. Therefore, branches in the crown can starve and die. If circling roots are small, about less than ⅛ in diameter, it is not much of a problem. Often circling roots can be fixed by pruning the roots to recondition the way they grow, however the treatment is not always successful. If there are too many roots which circle around, it is best to pick a different tree. Like animals, plants have different types of diseases as well. These diseases are seldom seen by humans because the disease causing organisms are microscopic. Plant diseases can affect any part of a tree or the whole tree, and become apparent on the tree once the disease takes hold of its host. Trees diseases are often named after the damage that they produce. Manifestation of certain disease may appear as: leaf rust, fire blight, and powdery mildew. A common plant disease that most of us have seen is leaf rust. Leaf rust is brown with yellow splotches on leaves. Even if this disease rarely kills plants, it turns them unsightly and cripples the by plant by interfering with photosynthesis. The solution for the tree to fix the problem is to shed its leaves in autumn. Fire blight changes the appearance of trees to seem as if they were scorched by fire. Leaves of some twigs wither and turn black or brown. 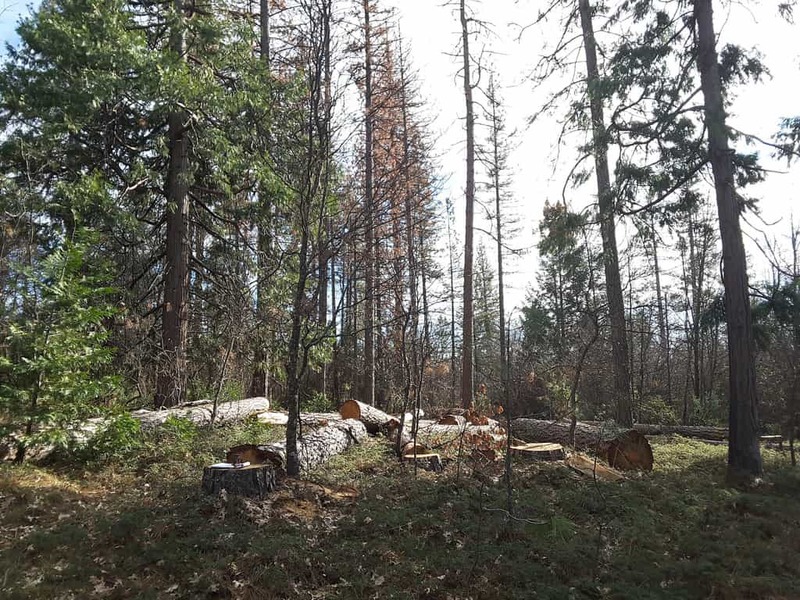 The bacteria causing fire blight is particularly active in warm, moist weather. Elements such as rain and infected pruning tools provide transportation for the disease to move. The best way you can treat trees from fire blight is to disinfect pruning tools, then prune said spots on the trees. A white coating that forms on leaf surfaces during dry, cloudy weather with high humidity is called powdery mildew. Several fungi can cause this disease, with plants that grow in shaded areas being most affected. Leaves are covered with a thin layer or irregular patches with a powdery, grayish-white material. Leaves may become distorted. Infected leaves may turn yellow or red and drop. In late fall tiny black dots are scattered over the white patches like grains of pepper. Not all diseases will kill plants and trees. However, it may hinder the growth and affect the look of the trees. 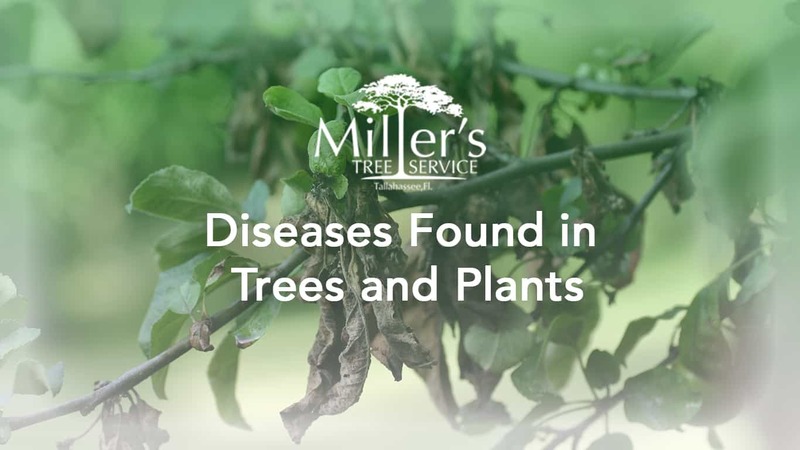 If there is a concern relating tree diseases, and especially trees affected by diseases that may inflict property damage, call Miller’s Tree Service for a free consultation with one of our certified arborists. Many of us start sneezing and getting watery-eyed when it comes to spring. We all know the cause of these symptoms, and it is pollen. In spring, male trees have to pollinate the female trees, which is their form of reproduction. So while this may be a nuisance for us, we can see why this is important to have so life keeps going. Around 375 million years ago, plants evolved to produce pollen to help spread their seed and population across landmass. This process helped plants and animals get to where they are today. Without an abundant amount of trees, we would have a less diverse and robust ecosystem of plants and animals. We should also keep in mind that these plants provide us with a much needed supply of oxygen. Plants evolved to pollinate so they can disperse their seed through the air. Initially, plants would rely on flowing bodies of water and animals to move the male seed to the female. Depending on water supply and animal population in an ecosystem, oftentimes plants would remain in a small area because there would be nothing to take them any further. However, with pollen, plants gained a chance to disperse on a greater scale. Plants began to take advantage and use winds to increase the travel distance of their seeds. If we look around our forests today, we can see how effective this evolutionary trait is. Plants produce a lot of pollen because it is usually hit or miss, so with more pollen comes a greater chance to successfully fertilize. Coniferous plants, which include pines, cedars, and redwoods are the most wide spread pollen producers, which rely on winds to do most of the job for them. Deciduous plants, like birch, oak, and maple trees use animals to help pollinate their seed. These different trees contain different proteins in their pollen. These pollen proteins when exposed to us can trigger our immune systems to go into overdrive mode. 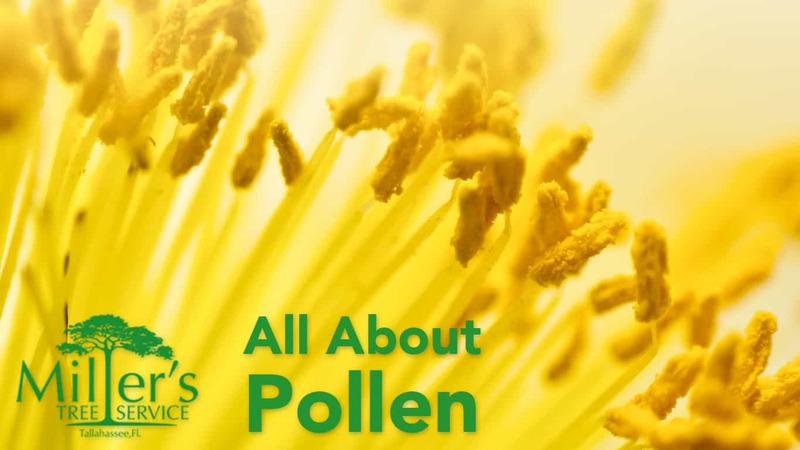 Everyone has an individual sensitivity to pollen, so depending where you are, you may be more or less affected by this allergy. Should You Prune Your Trees? Pruning trees can be a controversial topic in the arboriculture world; when and when not to prune, which trees need pruning, how it should be done. In general, we prune plants or trees to control their size, to produce a desirable shape, to increase vigor, and to increase flowering and fruiting. However, experienced arborists and gardeners will tell you the best time to prune is whenever it is necessary – any time of the year! The best rule of thumb is to not prune trees and shrubs during active growth. The worst time to prune is when new leaves are first forming. The best time to prune most trees and shrubs is during their dormant period, which is from December to February for most trees in Florida, just prior to bud formation in late winter. There’s nothing wrong with a big, bushy tree. Or is there? When a storm or hurricane blows through town you want it to be able to blow through your tree branches as well. Leaving a tree unpruned could be dangerous to the tree and to your home if it catches too much wind. Consider pruning trees that you can’t see through the branches from the base of the tree, and you may save yourself some serious damage. Dead or dying branches should always be removed if they are over a house or driveway or an area that receives a lot of traffic, however, in some cases it is okay to leave dead limbs to fall on their own if they are in a natural area that does not receive much traffic. It is natural for trees to shed limbs, much like people shed hair, and in many cases it does not mean the tree is in decline. If a tree has more dead limbs than live ones, then it would be a great candidate for removal. If you are unsure if your tree has too many dead limbs, set an appointment with one of our arborists to assess your tree and help you decide if removing it or pruning it is best for its future. While your tree may be in a good spot, where it’s branches grow may be another story. When branches start approaching telephone poles and power lines, it’s time to prune. They may not pose an immediate threat, but it’s best to tackle the problem before it becomes a problem! You also do not want tree limbs getting close to your house. They can cause expensive damage to your roof or siding, when a simple pruning could have saved you hundreds of dollars. Some of these branches can be pruned by yourself fairly easily, but some branches require professionals to deal with them. If your trees seem to be getting a little out of control or potentially dangerous, contact Miller’s Tree Service for a free estimate and consultation. We’ll determine the best course of action and remove all potentially harmful branches. Miller’s Tree Service isn’t just about removing dangerous trees or fallen limbs. We understand that tree care is also an important job that can benefit many people! Ever notice how your yard looks a lot different than when you first moved into your house? Maybe it looked cleaner or less overgrown. We can help restore your yard to its former glory! There’s a lot more to your yard than your lawn. Grass is the most noticeable thing when it comes to overgrowth, but what about branches, underbrush, and vines? In Tallahassee, a lot of property is surrounded by trees. Trees separating you from the neighbors behind you, on the sides, and maybe your house from the street. But what happens when you don’t regularly have someone like Miller’s help keep it in check? Trees and bushes grow, vines cover places they didn’t previously, and you start losing your yard to what used to be neatly carved nature! Often times this can be the result of new trees. Acorns fall, sprout out of the grown, and pretty soon you’ve got a sizeable tree where there was once clean space. Because this happens close to other growth, it often goes unnoticed! Without the tools and time, you’re helpless to the encroaching wilderness. This is where Miller’s Tree Service can help. It’s a lot easier to remove a sapling than a tree with it’s roots grown firmly in the ground! If you notice this happening to your yard, call Miller’s so we can work our magic. You’ll not only take back a part of your property once claimed by overgrowth, but it will look even better than it did when you first moved in. Remember, we’ll go out on a limb, for YOU! Unlike flowers, it’s not very common to see a tree in someone’s house. Unless it’s December of course! Trees require a lot of resources and space which make them poor house plants, and unless it’s of the Christmas variety, a tree in your house is probably not a good thing. So what brought about this tradition and how has it evolved. For this special entry in the blog, we’ll be talking about the history of this famous fir. So what is a Christmas tree? You may be surprised to know there are many different kinds, but they all fall under the category of “evergreen conifer”, including fir, pine, and spruce trees. Basically anything trimmable into that desireable triangular shape is used around the world as a Christmas tree! As plants are regional, where you live may decide what type of fir or spruce you’re getting. How did the tradition originate? Like many holiday traditions the Christmas tree has pagan roots. Seen as a symbol for life, trees were worshipped by many ancient civilizations. Other than their symbolic comfort, we start to recognize where certain traditions related to the tree originate with Medieval “mystery plays”. One such play, performed on the name day of Adam and Eve on December 24th, the tree is identified as the “tree of paradise”. It is decorated with apples similar to that of the tree in the Garden of Eden. These ornamental apples were later replaced with shiny red balls we now typically see on trees. In the 16th century it is said that Martin Luther would light candles on these trees, which would later be replaced with Christmas lights. 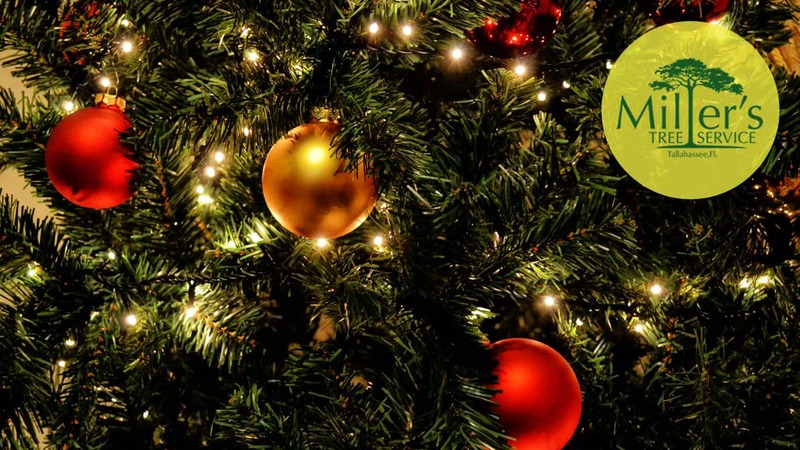 Because of this, Christmas trees were considered a Protestant custom, until it’s widespread popularity outside of Germany freed it of it’s denominational roots in other parts of the world. This was largely due to influential figures and families adopting the tree’s use. When Queen Victoria married the German Prince Albert they brought the tradition to the wealthier middle class, interested in escaping the cold industrial revolution to a simpler time of familial bonding. This was introduced to Victoria as a child by her grandmother, German-born Charlotte of Mecklenburg-Strelitz. Her association with the tree and the presents as a little girl made it a permanent Christmas custom for the royal family. This resulted in the first advertisements for “Christmas Trees” as a product for sale. This drove demand for all classes to take part in decorating and placing presents under the tree. The Christmas tree was just too good of an idea to fail. Combined with other traditions from around Europe, the Christmas holiday eventually became a melting pot of rituals centered around Christianity that most people in America celebrate regardless of whether they’re religious or not. Presents, stockings, Santa Claus, decorated trees, all culminating in a bright point for the cold winter. The tree’s comforting nature and seasonal spirit has cemented it in western culture, something adults and children both appreciate for similar reasons. The right tool is needed for every job, and the right people should be the ones handling those tools. 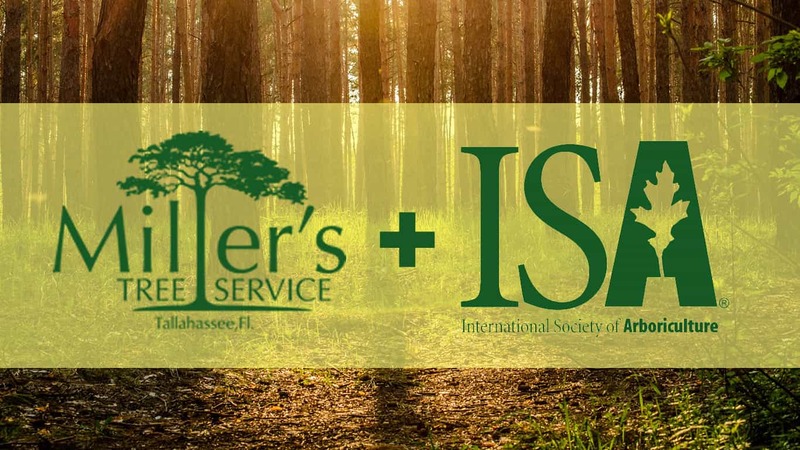 Miller’s Tree Service is proud to have 5 ISA Certified Arborists on the team, and the number of certifications is always growing. An ISA (International Society of Arboriculture) Certification means the arborist you hired knows what they’re doing. The requirements call for at least three years of full-time tree care experience and have a formal education in horticulture, forestry, and landscape architecture. After passing the ISA exam, arborists are either required to continue their education or retake the exam every three years to maintain their certification. It’s important we promote arboriculture in our community and educate tree workers to one day become ISA certified. Trees are an extremely important part of our ecosystem, which means knowledge about them is key. Beyond being able to remove a dead or dying tree, arborists assess every part of a tree to know how it should be cared for. Just because a tree isn’t falling over dead doesn’t mean it’s healthy; diseased trees can be invisible to the layman, but an educated arborist can tell if things are looking dire. ISA Certified Arborists aren’t just know-it-alls though! That three year experience requirement means they are capable of any service needed to help or remove a tree. What equipment and tools to use, how many men and women a job would take, how the job should be approached; all of these observations are made by knowledgeable arborists, but Miller’s Tree Service arborists get their hands dirty too. Pruning, trimming, felling, a certified arborist can do it all. The best tree service in Tallahassee also has some of the most hardworking and qualified arborists in the area. When your house is at risk, or you just want to beautify your property with excellent detail, Miller’s Tree Service should be your first choice. The knowledge, the work ethic, the ISA certified expertise, it’s all here.